This plugin is currently not actively maintained due to lack of time! Please use ProtocolSupport instead for the latest version. Don't use reviews to report bugs. Please use the issue tracker, private message or the discussion page! This plugin requires to have ViaVersion and Java 8 installed. Drag and drop both plugins in your plugin folder, and you are good to go. You can donate using this button, or you can donate using bitcoins. Please support 1.8 and lower? No, use ViaRewind or ProtocolSupport if you want backwards compatibility for 1.8 and lower. Can I use this with BungeeCord? 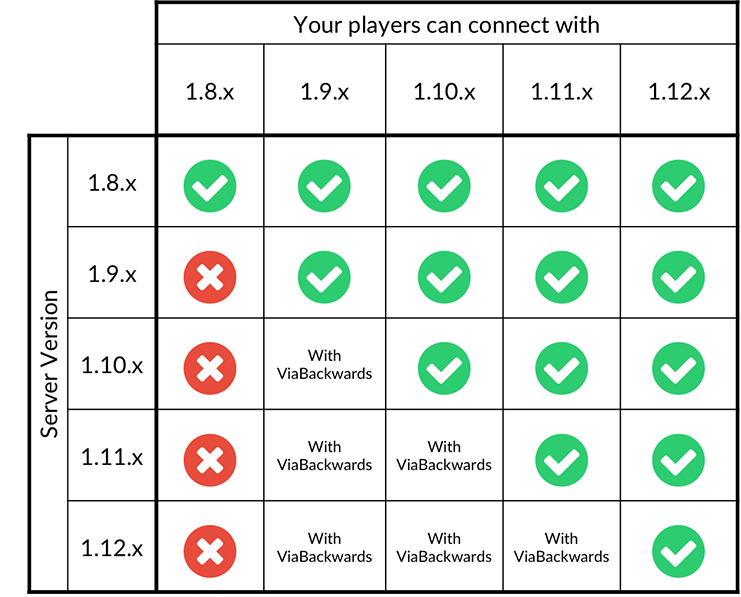 Yes, you can also use both ViaBackwards and ViaVersion with BungeeCord. How can I report issues and bugs? You can report bugs on the GitHub issue tracker. You can also use the Discussion section from the resource or send me a private message. Why did you not implement this inside ViaVersion? The aim of ViaVersion is to allow a newer Minecraft client on an older Spigot server, by making it inside ViaVersion, people will expect us to also create backwards compatibility in the future. I mainly created this for my own server, I don't know if I'll support backwards compatibility for newer versions in the future. Please update to Java 8 or contact your host to update. Zacharee1, Joedon, PurrfectMistake_ and 20 others like this. Really good job guys! This plugins is very util for many server I know, and talking with owners they told me they would like this plugin get updated. Actually also I want this plugin get updated because if not I'm forced to close my server and also other owner. Get busy guys and good luck! PS: I'm usin' development verisons! Don't rate bad, use those versions. It's a good plugin, does what it says it does. and doesn't require any additional configurations. I don't care much for 1.13 as I just want this for a skygrid server. which can run on 1.12 just fine. This is a great plugin, ignore all those kiddies giving 1-star reviews thinking this is a problem with this plugin when they haven't even set their EULA to true. Also, just because a plugin is still not updated but works great on older versions, it doesn't mean it deserves a 1-star. Stop shouting at the developers and giving them bad reviews, hoping they update. This is a resourceful but free plugin, and the developers are not slaves. They are temporarily inactive due to a lack of time, read the page. It's not like they have to update a free plugin on their work hours. I think people rate it badly because it's an important plugin in the comunity, and haven't seen an update in more than a year, despite a new major release of minecraft being out for 4 months. What's with all the one star weebs? This is an amazing plugin and I would love to see it in 1.13.2!